I feel like I read this book ages ago now – I better hurry up and write about it before I forget why I loved it so much. Obvious reasons: The High-Rise in Fort Fierce is made up of interconnecting stories about residents of the building over the years. And the high-rise is located in a small northern town in the Northwest Territories. If you’re like me, these are both good enough reasons on their own to pick up this book. But let me tell you a little more about it. Franklin Place used to be a swanky place to live – the tallest building around. But over the years it has declined – and with the decaying structure come a myriad of eclectic characters, which Zsuzsi Gartner describe as “the weirdos and the outsiders, the brave and the bewildered, the ruined and the barely redeemed“. There was a severed finger in Billy’s corn. Imagine that. Imagine even the thought of that. A finger, preserved in a can of vegetables, shipped on a pallet of selfsame cans, labels rubbing and scuffing as the truck rattled over potholes and gravel stretches, geared up in the northlands, meandered down the long road from Alberta, and eventually backed into one of the snow-encrusted loading docks at the grocery store in Fort Fierce, after which some high school student on a part-time evening shift unloaded and shelved the can behind still others, and each of them, one by one, were scooped into grocery baskets, tossed into carts, this particular can then sitting in Billy’s cupboard for months, a finger suspended in its darkness, until finally he opened it and poured its contents into a small pot on the rear element, which he covered while checking on his caribou steaks, only noticing the finger, with an astonished lift of his eyebrow, after he sat down to eat, way up on the top floor of the high-rise, in the exact same spot he’d sat in growing up. In this same compelling way, Paul Carlucci goes on to tell us about: Marly who hoped her dad would “turn into a fly“; young Amy who”twirled around the high-rise parking lot” while “the air was thick with fluttering ashes from Alberta’s forest fires“; the lonely, angry man with the dog and the telescope who invites Marly to his apartment; Jean-Paul who comes to watch his father die; Percy who suffers from low self-esteem and Linda who suffers from substance abuse and Monster who takes advantage of women who suffer from substance abuse; Josh who has a son in juvie and Dane who has a father who wishes he could have “assured him of his survival“; Sergeant Morris who is familiar with most of the criminals in Fort Fierce and is retiring from the Mounties, bitter and cynical and dating a woman he despises. And even the library, whose patrons were a “cross-section of the town’s most trying losers“. Everyone was a mess, even normal people. He fit right in. Despite the characters in Franklin Place being surrounded by crime, poverty, substance abuse, racism, and generational trauma, Carlucci writes about them with humour and compassion. And the resilient Marly reminds us: “Don’t forget to be happy“. Maleficium was a unique reading experience for me. Would I have still decided to read it if I had noticed the fantasy symbol sticker on the binding of the book? I don’t know, but I’m glad I did. It has long been rumored that the Archdiocese of Montreal held a book so dangerous that it had been consigned under lock and key to the most inaccessible reaches of its secret archives. Whoever might presume to exhume it from oblivion would be excommunicated forthwith and could entertain no hope of absolution. It is 19th century Montreal, and a series of seven men, telling seven different stories, come to the confessional of Vicar Jerome Savoie to warn him about a woman. Each of the men is afflicted with some sort of illness or deformity, and each has a story to tell about the curse of a young woman with a scar on her lip. The book is made up of these seven stories; each dark and exotic, taking place in or around the middle east. They all give a warning to the Vicar (and the church) about this woman coming to “ruin” him. Each man has a vice that leads him to his own ruin. The man greedy for saffron has no nose. The man who hunts tortoises for their precious shells loses his sight. The entomologist accepted a parasite that burrowed into his naval and drained him of all nutrients. The greed of the man who coveted the Persian rug made from the hair of 72 virgins led to the destruction of his hands. The desperation of the soapmaker to find the world’s best soap recipe is afflicted with a filthy face and the inability to wash it ever again for fear of the terrible pain. The woman in each of their stories arrives to tempt the man by offering her help in some way; with the smell of saffron, with golden scales more precious than tortoiseshell, with the location of the most coveted rug, with the purest oil for making soap. The woman is said to have a spine that lengthens into a tail, thorns growing out of her head, and the mark of the devil. “Flee, Father. Already she has begun to transform your church into a hellish pandemonium. The eighth chapter of the book ties the other stories together, for a startling and brilliant conclusion. What delicious linked story collections have you been reading? I love the sound of The High-Rise in Fort Fierce. Such a brilliant way of telling stories. Like you, I wouldn’t have picked up Maleficium but it sounds intriguing. I’ll keep my eyes peeled in case either or both should make an appearance here in the UK. I was thinking of you as I read The High-Rise in Fort Fierce! And, of course, now I HAVE to track down a copy! I love Olive Kitteridge as well. I love a good linked story collection! 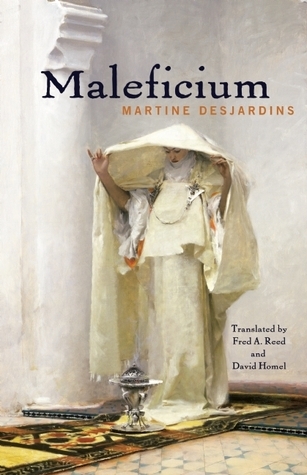 The covers would have drawn me to both of the ones you review; Maleficium sounds particularly intriguing. I’m currently reading two books that have been described as linked short stories: That Time I Loved You by Carrianne Leung (which you lucky Canadians got to read last year!) and Improvement by Joan Silber. I haven’t heard of Improvement – I’ll watch for your review! I hope you’re enjoying the Leung! Kitchens of the Great Midwest is sort of a linked short story collection in that each one focuses on someone different but they’re all connected to one central character in some way. Hvae you read that? I just started Olive Kitteridge and have just read the first story. It blew me away. I have a feeling I’m going to be giving it five stars, as I did her Anything is Possible and My Name is Lucy Barton. I gave Olive 5 stars – I loved it! I didn’t know that about Kitchens of the Great Midwest – another good reason to read it! (And I own it, too!) Thank you! You know how I love connected short stories! I probably would have stayed away from the fantasy genre too – just goes to show how much I coukd be missing out on. I’m glad I was paying attention to the recommendation and not the label! Oohh that first one sounds really good! And David Homel is a wonderful translator. Gosh it’s been awhile since I’ve read any linked collections. Does David Sedaris count? LOL He’s my favourite author of all time. 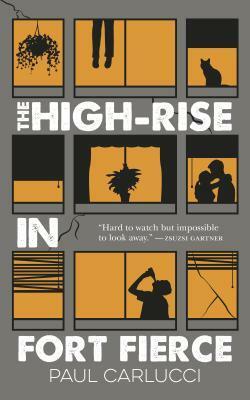 I heard about High Rise and then forgot all about it – thanks for the reminder! There’s something so appealing about linked short stories. I’m excited to hear that you heard about High-Rise! In the last couple of years I’ve really come to love short stories (it’s funny how that happens). But even better when the stories are linked – for the reasons you mention! Daddy Lenin by Guy Vanderhaeghe. I love short story collections! And linked ones are even more impressive, to my mind. These sound fascinating! Of course I want to read both of these now! I like the connected stories in Alice Munro’s Runaway. Also the trio of connected stories in Margaret Atwood’s Stone Mattress. And soon I’ll be rereading the connected stories about Linnet Muir in Mavis Gallant’s Home Truths. I’ve just started to read Chitra Banerjee Divakaruni’s collection of linked stories, too: Before We Visit the Goddess. So far I love them. They move across time but stay in a single family (which I think is true of that lovely collection of Carol Bruneau stories – the ones set in the mining town, too). Now I wish I had Home Truths – I didn’t know they were connected! And I’d love to re-read Runaway – it’s been too long to remember properly. Which Bruneau is the linked story collection? A Purple Thread for Sky or After the Angel Mill?